After years of wild adventures overseas, Miss Sophie Everton is in no hurry to return home to the boring strictures of the ton. 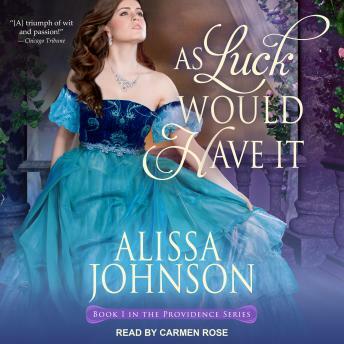 But she's determined to reclaim her family's fortune-even if she has to become a spy for the Prince Regent to do it. Before she can get her first assignment, she lands right in the lap of the dark and dashing Duke of Rockeforte. She's faced hungry tigers that didn't look nearly as predatory. Somehow the blasted man manages to foil her at every turn-and make her pulse thrum with something more than just the thrill of danger. Both are caught in a daring dance of espionage and desire. But to make a true love match, they'll have to learn to trust in each other . . . and, of course, a little bit of luck.